With its dark evergreen leaves and clusters of bright red berries that ripen precisely in time for Christmas, the toyon (Heteromeles arbutifolia) is also called California Holly and Christmas Berry. It is the basis of the name “Hollywood”, because the hills in that part of southern California were populated with toyons. In fact, collecting toyon branches for holiday decoration became so popular in Los Angeles during the 1920s that the State of California made it illegal to harvest “any tree or shrub … growing on state or county (property) … without a written permit from the owner of the land” (CA Penal Code § 384a). Of course, the cedar waxwings, robins, mocking- birds and other birds that feast on the berries are exempt from the law! 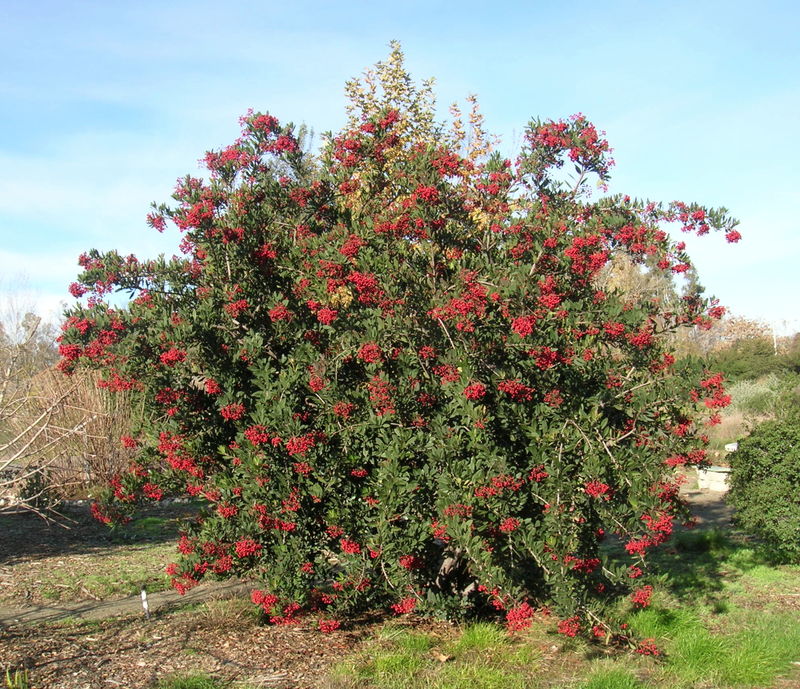 Choosing Toyon for Your Landscape If you have enough space, your multi-stemmed toyon can spread out up to 15-20 feet tall and equally wide. But if you pinch it back a little each year, it will remain dense and manageable. Just be sure to prune it back after the berries ripen but before the new flowers form in early spring, or you will end up pruning off next season’s berries (a mistake Jim made his first year at the Granada Native Garden). Time it right, and you will be rewarded in late spring with an equally dramatic display of white blossoms. Toyon’s Importance to Native Americans Most of the plants at the Granada Native Garden were used by the Native Americans in one way or another – for food, medicine, tools or clothing. Like a number of other native plants, toyon berries contain a small amount of toxic cyanide-forming compounds “which can kill you if you eat a few pounds”. But the toxic ingredient is removed by cooking or roasting, and the berries were gathered by many Indian tribes (Chumash, Tongva, Tataviam) and roasted over coals or boiled, then mashed and eaten out of hand, or made into a jelly or a beverage, or dried and stored for cooking into porridge. Tea made from the leaves was used as a remedy for upset stomach. Fire Blight? 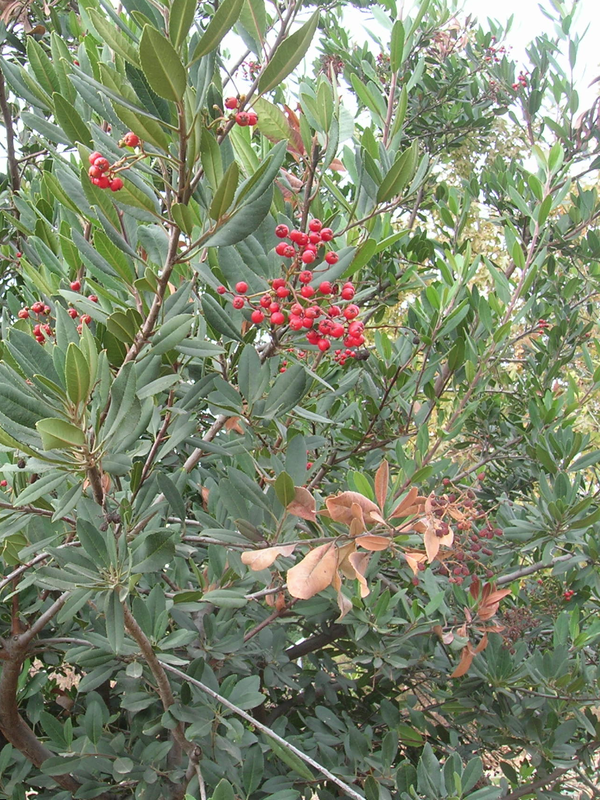 The toyon at the Granada Native Garden has had no water except what falls from the sky during the winter. Toyon is a member of the family Rosaceae, which includes pears and apples. (Botanically speaking, this also means that the berries are not true berries, but rather miniature pomes, like apples and pears.) These fruits are famously susceptible to fire blight, a disease caused by a bacterium, resulting in the youngest leaves of some branches turning brown and drying up; the disease can destroy limbs and even entire shrubs or trees. This year, we suspect that fire blight has attacked our toyon! We hope that it eventually overcomes the attack and regains its former splendor. Current Updates The Granada Native Garden is now identifiable to passersby, thanks to an anonymous benefactor who made signs (the one that says “Granada Native Garden”, not the other one) for each of the three entrances to the GNG! The GNG is becoming a destination! Last spring, when the poppies were in full bloom, one family considered the Garden as a location for an engagement party. And this month, the Practical Film and Media Work- shop, a vocational program designed to provide adults with developmental disabilities an initial entry-level working knowledge of film production, has chosen the GNG as a site to produce a film about their activities. The precise date and time has yet to be confirmed, and of course it depends on the weather. Nice post! I have yet to try cooking and eating the berries. Perhaps this year. Great information Jim! I am bringing my Las Positas Comm Ed class on Landscaping with Natives there on Sat March 22nd mid morning. GNG looks much better than my backyard! Glad to hear the public is using it! March is a fairly good time to visit — the poppies are coming into full bloom. I hope we get enough rain to get a good show of poppies and other natives. 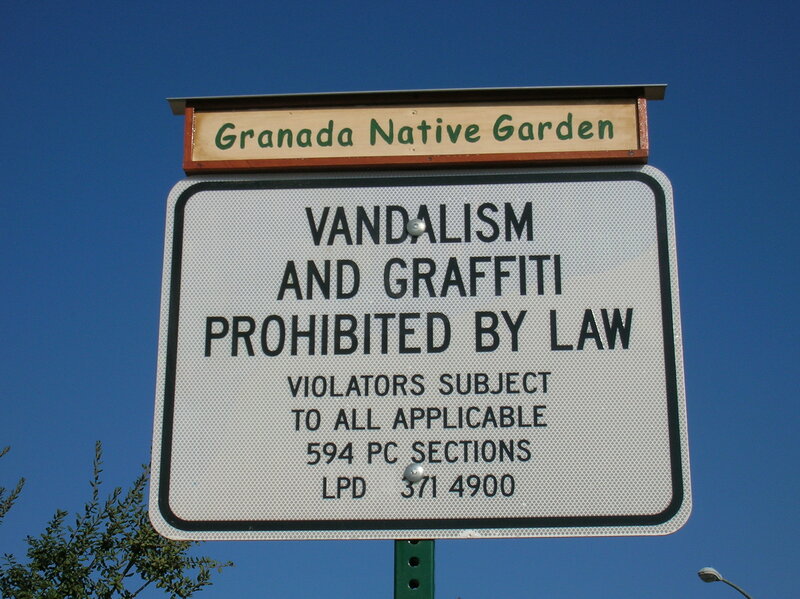 I really like the new Granada Native Garden signs!! The poppies seem to be popping up every where 🙂 Should be really nice and colorful mid March. 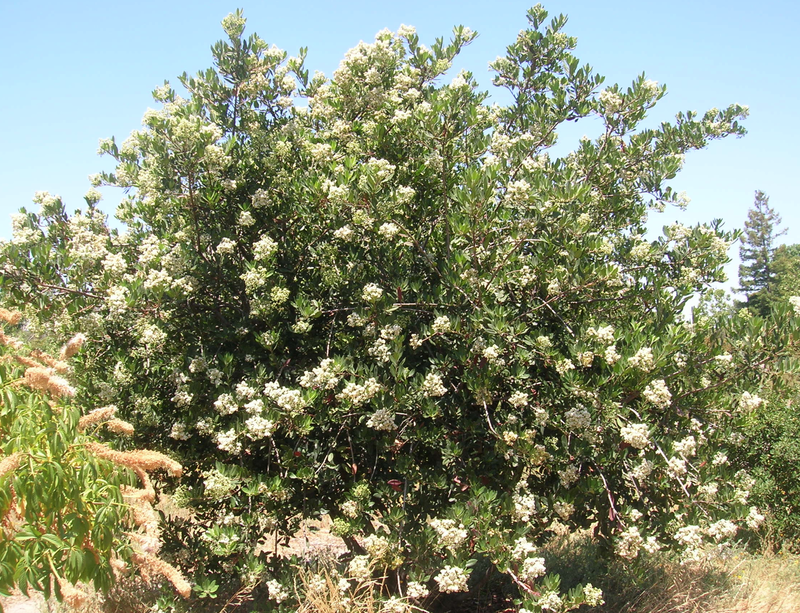 Nice info on the Toyon; thanks for sharing your knowledge!